In 1991, exploring just 400 miles from the present-day South Pole, geologists discovered the remains of dinosaurs! This discovery confirmed what many scientists had inferred—that 200 million years ago Antarctica had a warm climate, with forests and flowing rivers, giant fern trees, dinosaurs, and many smaller animals. How could this be? Most geologists believe that 200 million years ago this region was not at the South Pole. At that time, Antarctica was part of a huge land mass called Pangaea, which consisted of all the continents we know today. The rest of Earth was ocean. Gradually, the land mass broke apart and the pieces, which are the continents we know, “drifted” to their current locations. If that seems unbelievable to you, you’re in good company. Before the 1960s most scientists did not believe this could have happened, but the theory is accepted today. That’s one of the qualities of a scientific revolution. Ideas that are accepted today once seemed unbelievable. How the theory of continental drift came to be accepted is a wonderful example of how science works. By the end of this chapter you may still think this theory is farfetched, but you’ll understand the evidence that led scientists to accept it. You’ll also find out what the theory predicts about how Earth’s climate is likely to change in the future. One of the early theories to explain how the surface of our planet developed mountains, plains, and valleys was the wrinkled Earth theory proposed by James Dwight Dana, a respected geologist from Yale University. This theory was widely accepted by most geologists by the early 1800s. According to this theory, Earth has been cooling since its formation. The crust of the cooling Earth had shrunk and buckled like the wrinkled skin of an old apple, thus forming mountains and valleys. One quality of a useful theory is that it can also explain other observations or problems that arise. One of these problems was explaining the finding of similar fossils on continents that were widely separated by oceans. For example, dinosaur fossils were found on just about every continent. Those who believed in the wrinkled Earth theory surmised that land bridges—such as Atlantis, an imaginary continent—had once connected today’s continents, making it possible for animals to migrate from one continent to another. These land bridges eventually disappeared under the oceans as Earth continued to contract. That idea started a search for the lost continent of Atlantis. Eventually the wrinkled Earth theory lost favor when it was discovered that radioactive materials deep underground would keep the planet warm, so that it would not cool and contract. Also, Atlantis was never found—though it formed the basis for some wonderful science fiction stories. 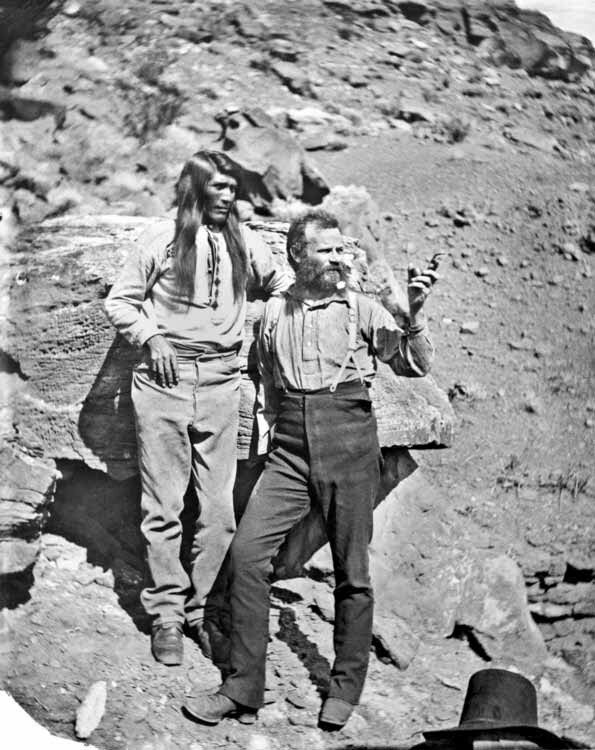 Major John Wesley Powell (right) is shown here with Paiute Indian Chief Taugu during an expedition to the Grand Canyon. Photo Courtesy of the Smithsonian Institution. In the 1870s, John Wesley Powell, a geologist and explorer, led a series of expeditions to the Grand Canyon and the surrounding region. Powell wondered why the Canyon was so deep. He knew that canyons were cut by rivers that sank deeper and deeper as they slowly wore away the surface of the land. Older rivers became broader and slower. It seemed to Powell that the Colorado River should have slowed and stopped cutting channels long ago. Powell suggested that the entire region was slowly pushed upward, causing the river to flow faster and faster, and to cut deeply through thousands of feet of sedimentary rock. Powell’s theory is widely accepted today. 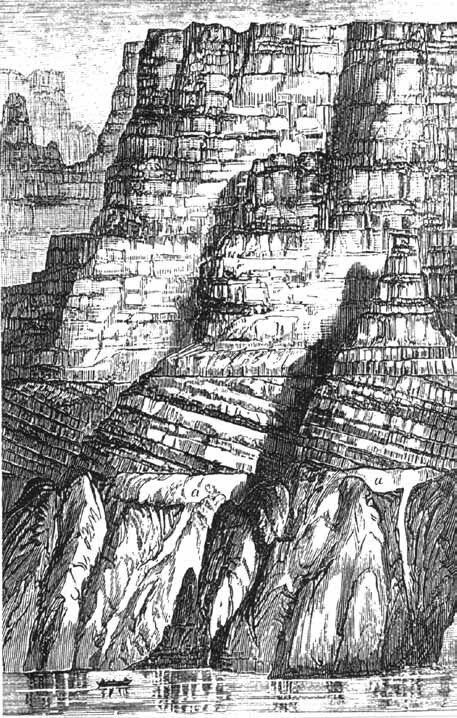 Clarence Dutton, a geologist who spent many years exploring the Colorado Plateau, agreed with Powell and went further to suggest a cause for the uplift. Perhaps the denser parts of Earth’s crust sank to form the ocean floor, while less dense regions floated higher to become continents, mountains, and plateaus. Thus, the force of gravity kept the continents and oceans in equilibrium, so it was physically impossible for a continent to sink. The lost continent of Atlantis, if it existed, would bob to the surface like a cork in water! Later investigations confirmed that rocks that made up continents were generally less dense than those that made up the ocean floor. That meant that Powell and Dutton were right in that continental crust would tend to float. However, the equilibrium theory was not complete because it did not explain why similar fossils were found on widely separated continents. An artist who accompanied Powell drew a picture of the expedition. dwarfed by the huge wall of the Grand Canyon. In the later years of the nineteenth century and into the twentieth century, more and more evidence was gathered pointing to a connection between Africa and South America. Many fossils of similar plants and animals had been found on both continents. Moreover, rock formations in these areas were very much alike. How could there be such similarities in continents so far apart? To explain the connection between South America and Africa some geologists revived the idea that a land bridge may have once existed in the middle of the Atlantic Ocean, between the regions we now call Brazil and western Africa. However, no evidence of such a land bridge was ever found. 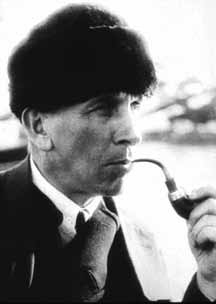 Alfred Wegener, a German physicist, meteorologist, and explorer suggested a different explanation for the connection between these continents. His idea was to become so important that it eventually transformed the entire study of geology. Wegener’s idea was that South America and Africa were once joined together in a single huge continent. The continent split apart and the fragments, which became today’s continents, slowly drifted apart over millions of years. Throughout his lifetime, Wegener was ridiculed for his idea of continental drift. Now, his theory forms the basis for just about all studies of Earth’s crust. Photo Courtesy of the Alfred Wegener Institute for Polar and Marine Research, Bremerhaven, Germany. Wegener’s theory was originally published in German in 1915. 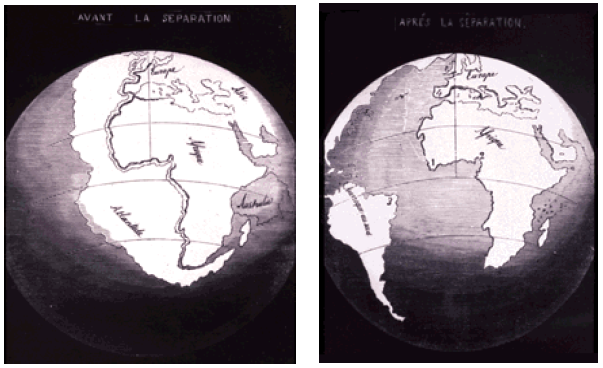 Later, the book was translated into English and published in 1924 as The Origin of Continents and Oceans. 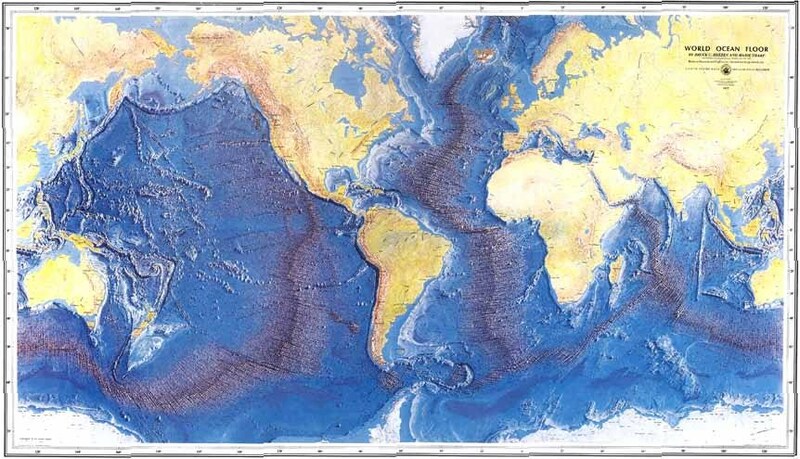 In his book, Wegener proposed that if the shapes of the continents were cut out of a map along the edges of the continental shelves (where shallow water ends and deep ocean begins), then the shapes could be assembled in a global jigsaw puzzle. Fitting together South America and Africa along their continental shelves, Wegener showed that mountain ranges and geological deposits appeared continuous across both continents—further evidence that they were once connected. Wegener also applied his theory to explain the formation of mountain ranges where continents collided. He used the theory to explain massive climate change as the result of a continent (such as Antarctica) that drifted from the equatorial region toward one of the poles. And he explained the similarity of early life forms as having their origin in the period when the continents were united. Wegener called the united land mass Pangaea, which means “all land” in Greek. Today, scientists are convinced that Wegener’s arguments are correct. But in his day, Wegener was ridiculed. No matter how much evidence he collected, most scientists did not believe him. It was not that his evidence was wrong, but rather that he had no satisfactory answer to the basic question, How could a huge continent move through the dense rock of the ocean floor? Where, his critics asked, is the force that could move the vast areas of land and mountains of the continents? Wegener thought that the ocean floor might flow very slowly, like dense molasses, but that idea seemed implausible. His whole idea seemed absurd. Wegener died in 1930, while leading a heroic effort to rescue fellow scientists on the Greenland ice cap. Meanwhile, his theory of continental drift died an equally icy death in the lecture halls of universities and at research laboratories around the world. No one could understand how continents could possibly move. 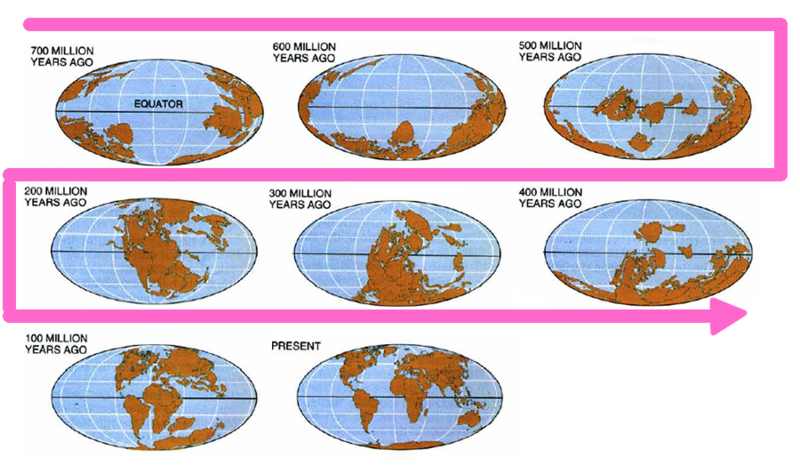 Eventually an explanation was found for how the continents could drift across the face of Earth. The idea depends on convection currents—the movement of fluids due to uneven heating. You can explore convection currents in the next activity. Later in this chapter we’ll find out how convection currents were used to support Wegener’s theory of continental drift. Explore convection currents using a model. In the previous activity you observed that water rises when it is heated. Understanding why warm water rises is not obvious. It is based on a change in the density of water. Density is defined as the amount of mass (material) in a given volume. Most substances become less dense when they are heated. That is because the molecules that make up the substance move faster as they are heated. The hot molecules collide with each other, and push apart, so the same amount of material fills a larger volume. Therefore, warm water is slightly less dense than the surrounding cooler water. The denser an object is, the harder it is pulled by gravity. A golf ball and a ping pong ball take up about the same volume of space, but the golf ball has more matter packed into it. It is denser, and so it is pulled harder by gravity. You can feel that pull by holding a golf ball in one hand and a ping pong ball in the other. The golf ball is “heavier”; which is another way to say it is pulled more strongly to Earth by gravity. Similarly, cool dense water is pulled harder by gravity than warm water. When a region of water is heated, it rises because it is pushed upward by the surrounding cooler water. In your investigation, as the warm water in the pan spread out on the surface, it cooled. When it reached the edge of the pan, the water cooled enough to fall to the bottom and move along the bottom to the middle of the pan, where it was again heated. This continuous cycle, called a convection current, can occur with any fluid that is heated unevenly. It can occur in air, in water, or even in molten rock (magma) deep inside Earth. In the 1930s, Maurice Ewing, a young geophysicist, was innovative in using explosives to investigate the ocean floor. With microphones he recorded the vibrations, or seismic waves, produced by the blasts of dynamite, after they had reflected from various layers of rock and soil. 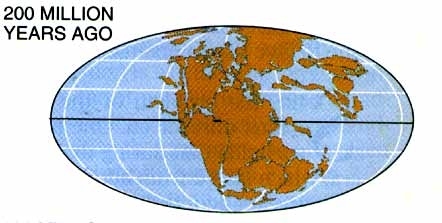 Ewing used the sound waves technique to research the continental shelves, the shallow water areas along the edges of the continents. During the Second World War, Ewing worked for the Navy to help develop methods to detect enemy submarines and to map the ocean bottom. The technique he helped to develop, called sonar, also used reflected sound vibrations, but the sonar sounds were more subtle and the receiving devices far more sensitive than earlier ones. After the war, Ewing explored the Mid-Atlantic Ridge, a long range of submerged mountains in the middle of the Atlantic Ocean. Since it was then believed that the Atlantic Ocean was very old, scientists had predicted that Ewing would find sediments that were as much as 12 miles thick, and which might include fossils that were hundreds of millions of years old. Surprisingly, however, he found little sediment and no ancient fossils. Instead, he discovered volcanic rock, indicating that the floor of the Atlantic near the ridge was very young. 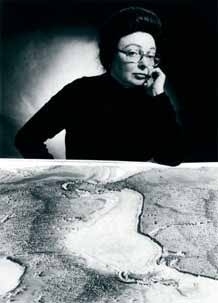 Marie Tharp and the map she created with Bruce Heezen. Photo courtest of The Columbia Earth Institute. 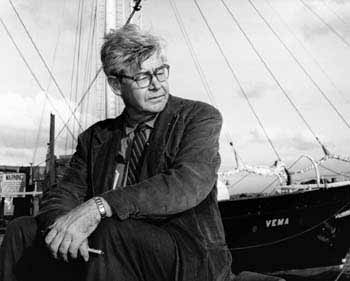 Ewing wondered why the edges of the Atlantic Ocean floor were older than its center. A clue was provided in 1953, by the work of Marie Tharp and Bruce Heezen, researchers at the Lamont-Doherty Earth Observatory. Tharp had the specialized training to create a map of the ocean floor based on Ewing’s data. Meanwhile, Bruce Heezen was researching the locations of earthquakes in the Atlantic. He used the map created by Tharp to plot the locations of earthquakes. As more and more dots were placed on the map, it became clear that there was a pattern to the data. During the next three years the Lamont-Doherty researchers expanded their work to include data on ocean depths around the world. The map that they produced (on next page) revealed an immense 40,000 mile (64,374 km) chain of mountains, with a valley running through its center, that winds its way through the oceans of the world. 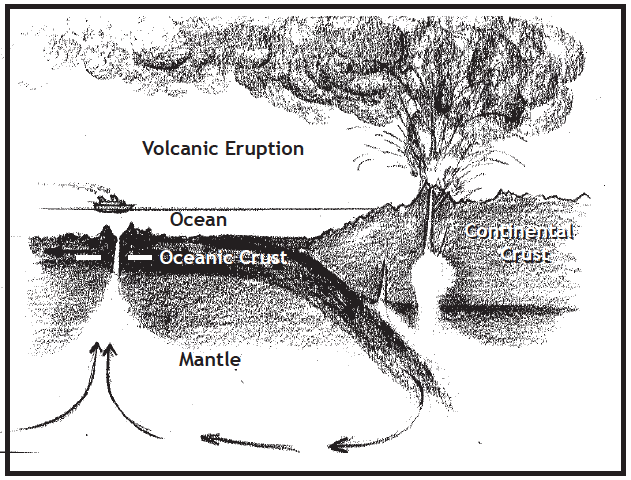 Tharp and Heezen believed that the underwater canyon was a rift, or split in Earth’s crust, where new volcanic material was coming up from the mantle below and forming new material along the ocean floor. This new material literally pushed aside the ocean floor and the continents at the edges of the ocean. This interpretation would also explain why the edges of the Atlantic Ocean were much older than the middle, and why the continents may be spreading apart from each other. In some places along the Mid-Atlantic Ridge, volcanoes are currently active. New volcanic rocks erupt through openings, or vents, building underwater mountains. It was these vents that oceanographer Kathleen Crane explored in a submarine, as described in an earlier chapter. This map, first produced by Marie Tharp and Bruce Heezen in 1953, supported Wegener's theory of continental drift, and changed the way scientists view Earth's geologic history. This version was published in 1977. Reproduced with permission of Marie Tharp. Another piece of the puzzle was discovered by Harry Hess, a geology professor at Princeton who had commanded a naval vessel in the Pacific during World War II. Hess’s ship was equipped with a device that continuously measured the depth of the Pacific Ocean by timing signals as they bounced off the bottom. With this device Hess discovered a large number of undersea mountains with flat tops. It seemed to Hess that they were extinct volcanoes that had been part of that mid-ocean ridge where new volcanic material was continuously coming up from the depths. Thrust up to the surface of the ocean, a volcano would be exposed to wind and waves, and in a few million years would be worn flat. As new material came up through the canyon, the older volcanoes would be pushed aside. Over millions of years the old flat-topped volcanoes would be spread further and further away from the ridge, and gradually sink as the crust of the ocean floor aged and became more and more dense. Hess’s theory of a spreading seafloor was similar to Wegener’s theory of continental drift. However, Hess was able to explain the movements of the crust in a way that made sense to physicists—something that Wegener was unable to do. Borrowing an idea proposed thirty years earlier by Dutch scientist Felix Meinesz, Hess suggested that the source of energy that moves the crust of the planet is the heat produced by the decay of radioactive materials deep inside the earth. This heat creates huge bubbles of heated magma which causes molten rock to be pushed up and out along the mid-ocean ridge and to flow slowly along the surface where it cools and becomes more dense. It is then pulled downward again into the mantle. This may remind you of the movement of the tea leaves in the activity on observing convections currents. The principle is the same. In 1964, Sir Edward Bullard, a British geophysics professor, used a mathematical theorem and his computer to show how continental drift could have occurred. Bullard showed that the continents were once closely fitted together and that as segments drifted apart, they rotated slightly. For example, if South America were rotated slightly counterclockwise and Africa rotated clockwise, they would fit tightly. The same would be true in realigning the other continents and bringing them close together to form, in effect, Wegener’s Pangaea. Bullard demonstrated his finding to geologists at a special meeting of the British Royal Society. His presentation supported the continental drift theory. Within the next five years more evidence came to light that convinced the vast majority of scientists that the ideas of Wegener, Tharp, Hezeen, Hess, Bullard, and others were correct. The data included surveys of the magnetic properties of rocks and studies of fossils on the floor of the ocean. More recently, satellite measurements showed that the Americas are indeed moving apart from Europe and Africa, at about two centimeters a year. In less than a decade the study of Earth had been completely overturned. The revolution was complete. Scientists who had spent their entire careers arguing against the theories of continental drift and seafloor spreading turned their energies to deciding how to apply the new knowledge. 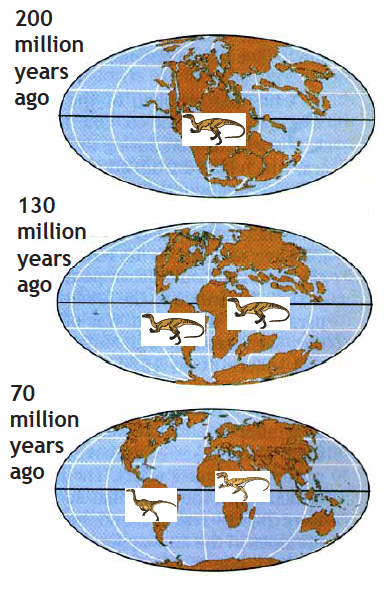 The results of continental drift over the past 700 million years. Each map is shaped to show the Earth's entire surface. From "The Evolution of the Earth," by Chaude J. Allegre and Stephen H. Schneider, Scientific American, October 1994. This drawing illustrates the idea that the division of the supercontinent Pangaea, about 200 million years ago, contributed to the process of evolution. For example, after a population of dinosaurs was separated, changing conditions on the now-separate continents would have led to different paths of evolution. The result would be different species of dinosaurs descended from a common ancestor. By the late 1960s, Wegener’s idea of continental drift and Hess’s idea of seafloor spreading were widely accepted and had a new name: the theory of tectonic plates. The word “tectonic” is based on the Greek word tekton, meaning “builder.” The “plates” are huge sections of Earth’s crust which are nudged along the surface by convection currents of the hot magma below. Nine major plates and several smaller ones have now been identified. The cracks between the plates allow volcanoes to develop there, and earthquakes occur where the plates spread apart, collide, or push down into the mantle. The movement of the Antarctic land mass illustrates one of several connections between the tectonic plate theory, life, and climate. The breakup of the supercontinent Pangaea, some 200 million years ago, sent the various continents on their way to different climate zones. It was then that the North American plate began to move away from its contact with what is now Europe and Northern Africa and to allow the Atlantic Ocean to form. The movement continues today. We and all life on the North American continent are being carried westward at the rate of between 10 and 20 cm per year. 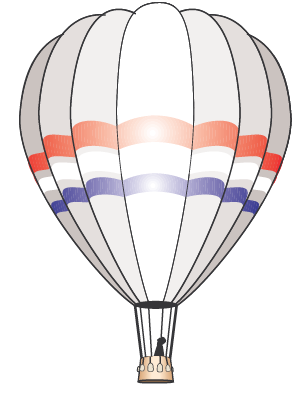 In the past, life forms evolved as their huge “life raft” gradually drifted to warmer or cooler latitudes. Many life forms did not adapt to the changed conditions and perished, but others adapted and survived. Shifting crustal plates also affected the global climate in other ways. Where two continental masses collided, mountain ranges were uplifted. When the plate on which India was located crushed against China, the Himalayan Mountains were formed. As the distribution of land and ocean changed, so did the air and ocean currents, bringing warmer weather to some parts of the globe and cooler weather to other parts of Earth. In certain areas, such as the southwestern United States, huge plateaus were formed as parts of continental plates were pushed upward from below, creating cooler weather and subjecting the land to new erosion patterns. The fossil evidence is strong that the merging and separation of continents profoundly affected the evolution of life. Plants and animals can migrate when continents collide, while life forms can be separated into isolated communities when the continents separate. On a time scale of hundreds of millions of years, Earth’s climate has never been constant, because Earth’s surface is always changing. The shifting of continents creates new habitats and destroys old ones. Life must either adapt or die. It is important to recognize that tectonic plate movements are very slow. Consequently, the rate of change in climate due to such movements is also gradual. The huge plates move across our planet more slowly than a snail’s pace. As long as climate changes slowly, life can adapt. If climate changes swiftly, some species may not survive. This chapter began with a question: How did dinosaurs get within 400 miles of the South Pole? The theory of plate tectonics offers a logical explanation. The continent that is now Antarctica was once part of the supercontinent Pangaea. Around 200 million years ago, during the time when dinosaurs dominated the planet, this continent was much closer to the equator than it is now, and the climate of the entire planet was warmer. After the breakup of Pangaea, Antarctica drifted southward and gradually became colder. Eventually, the plants and animals died and were buried in the ice, where we find them today.